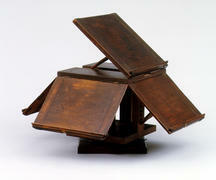 This revolving bookstand, once thought to be a music stand, was probably made to Jefferson's design and specifications in the joinery. As many as five books could be placed on it at a time. Jefferson may have conveniently placed it next to his chair in his reading-and-writing arrangement in the Cabinet. It is one of three known "revolving " works made in the joinery; the other two are tables. Dimensions 19 3/4 x 26 3/8 x 26 3/8 in. Charles L. Granquist, Jr., Cabinet Making at Monticello, 14.